Italian niche line Bruno Acampora has launched Bianco and Nero, two new fragrances. 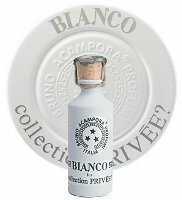 Bianco (shown) ~ "Bianco is a floral chypre that opens with classic elegance - cool, sharp citrus over wood, musk and patchouli. You settle in for a lovely walk in a green spring forest dotted with lily of the valley, but as you walk along, you notice a few unexpected things – a sparkle of spice, a flourish of berries -- and you begin to suspect that the forest is enchanted..." Additional notes include lemon, orange, bergamot, coriander, rose, ylang ylang, clove, pepper, jasmine, tonka bean, sandalwood, vanilla and raspberries. Nero ~ "Intense and provocative. Nero is a take-no-prisoners woody oriental that mesmerizes and fascinates..." With notes of citrus, saffron, cedar, patchouli, sandalwood, amber and musk. Bruno Acampora Bianco and Nero can be found now at Luckyscent, $185 each for 10 ml Perfume Oil. I love this line and never hear much about it. I assume most people don’t like the fact that the’re oils, but their fragrances are soooo lovely and rich. Prima T is in my Top 10. I think you’re right that fewer people want oils…nice to see these in EdP.